Why would I need facial reconstruction? Skin cancer is the most common form of cancer in the United States. It is highly prevalent in people who have had significant exposure to sun throughout their childhood and into adulthood. The climate and weather in South Florida makes it a hot bed for this type of cancer. Fortunately, the majority of skin cancers are treatable with removal. Often times a surgeon or dermatologist will treat a skin cancer by excising it. MOHS surgery is a popular method for removing skin cancer. The advantage of MOHS surgery over standard excision, is that the edges of the removed cancer are carefully examined under the microscope at the same time as when you are having the cancer removed. This allows the MOHS surgeon to be certain that the entire cancer was removed without leaving any of the “roots” behind. 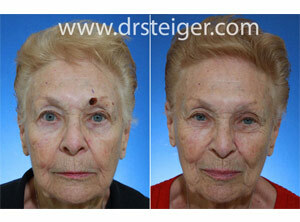 Success with MOHS surgery has been reported to be 99%. The benefit of MOHS surgery in an areas such as the face or nose, is that the amount of healthy tissue removed is kept to a minimum without compromising the removal of the cancer. 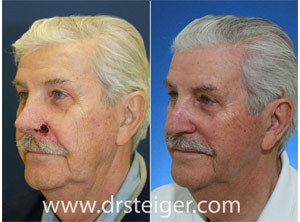 TMOHS surgery is performed by a qualified dermatologist with specialized training in the MOHS procedure. 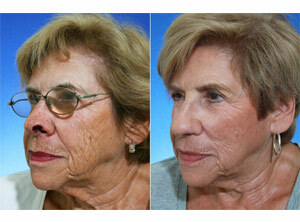 MOHS reconstruction is performed utilizing different types of grafts and/or flaps to close the defect. The type of repair performed depends on the size and location of the wound. A graft decribes the process by which tissue from one area of the body is used to repair or replace tissue in another area of the body. An example of this is a skin graft. Skin grafts are autologous grafts, meaning they are taken from your own body. Skin grafts are useful to repair certain types of skin cancer or traumatic defects. Other examples of grafts are cartilage grafts. Cartilage grafts can be taken from the ear, nasal septum, or the rib. They are often used to repair large defects of the nose and/or ear. A local flap describes a repair tha involves using the surrounding skin and soft tissue in order to close a defect. This is analogous to putting a puzzle together. There are many different types of flaps that can be performed to repair skin cancer defects. These include transposition flaps, interpoolated flaps, island flaps, and advancement flaps. When will you decide what repair is best for me? 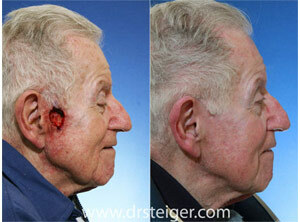 You will have a good idea about which type of repair may be necessary prior to the removal of the skin cancer. The final decision will be made once the entire cancer has been removed and the defect is examined. Can I see examples of the type of reconstruction that I may need? Yes. We will show you an extensive photographic library of patients who Dr. Steiger has repaired to give you a better idea of what to expect. Some very large defects may require staged procedures. If this may be necessary we will show you exactly what you can expect after the procedure. 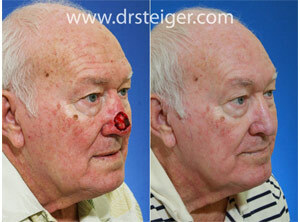 Many reconstructions are performed in our comfortable office procedure room. Larger repairs are performed in an outpatient ambulatory surgical center. Does insurance cover MOHS reconstruction? Yes. Most insurance companies will cover reconstruction after MOHS micrographic surgery. Will I have much pain after the procedure? No. Most patients do not complain of significant pain after the procedure. In fact, the majority only take over the counter Tyelnol for pain. We will prescribe you a mild narctic pain medication just in case you may need it after surgery. Most patients prefer to take several days off after the procedure. However, you may return back to work as soon as the next day. If a larger flap is performed, you may want to take more time off of work depending on your profession. You should discuss this with your doctor depending on your type of work and the procedure performed.